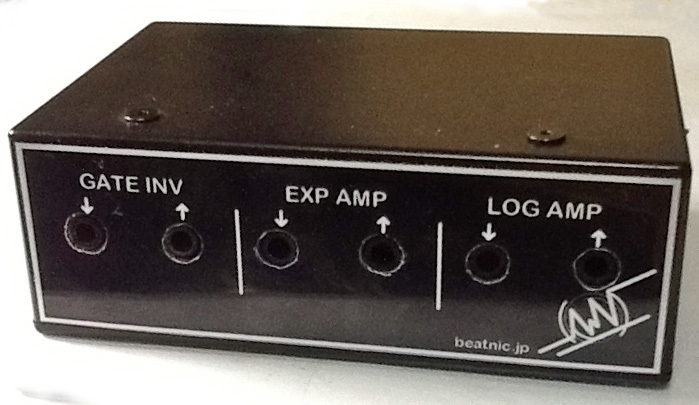 beatnic.jp : New product “Log/Exp Amp” will release. Let me introduce to you a new products of beatnic.jp. I take it to some event in this Fall. Thank you for many feed backs. It’s synth module that combine with MS-20mini from korg. “Log/Exp Amp” is set of 3 modules that’s not include with Korg MS-20 mini inside. First module is ”Exp Amp”. This module will convert the CV that V/OCT system to V/Hz system. this module allow you to use popular analog sequencer or musical keyboard for MS-20 mini’s VCO. Next module is “Log amp”. This module will convert the CV that V/Hz system to V/OCT system. MS-20’s keyboard outputs CV as V/Hz system. This module converts it to V/OCT system. this module allow yout to play EURO-RACK module’s VCO by MS-20 mini’s keyboard. The last module will invert polarity of gate. you can drive MS-20 mini by TB-303’s internal sequencer or so. Those of 3 modules are packed into small box that can ride on top of MS-20 mini. This box requires AC adapter separately from MS20 mini. this products is intended to use with MS-20 mini to expands its capability. and this module is the one of the serial products. and there should be another modules something like OSC or Filter in same price range. 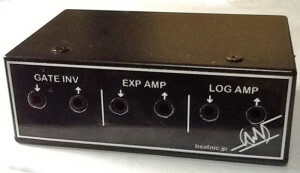 beatnic.jp will make it for the user who need more possibilities. #”MS-20 mini” is trademark of KORG INC.